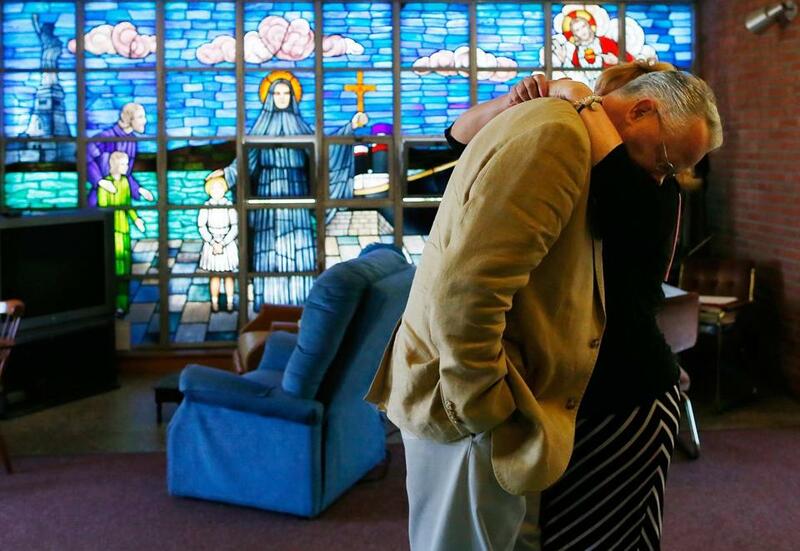 Jon Rogers was hugged by his wife, Maryellen, following a service Sunday at a church declared closed by the Archdiocese of Boston nearly a decade ago. SCITUATE — Brilliant sun streamed in through stained glass at St. Frances Xavier Cabrini Church on Sunday morning, and voices rose in prayer to the sanctuary’s peaked ceiling as about 30 residents of this idyllic seaside town came together in worship. The service was simple, with no priest and little ceremony, the norm since the Archdiocese of Boston declared the church closed nearly a decade ago. Congregants have kept its doors open through a round-the-clock vigil and vowed Sunday to keep fighting, despite saying that they learned on Saturday that the Vatican’s highest court had denied their final appeal to stop the archdiocese from repurposing, leasing, or selling the building. Jon Rogers, a leader of the defiant congregants who formed the nonprofit Friends of St. Frances Xavier Cabrini, said they would not leave the church willingly. The last Mass. parishioners occupying an officially closed church are vowing to fight on, despite a final ruling against them by a Vatican court. He said that if the archdiocese will not reopen St. Frances, it should sell the church building, parish center, and parking lot to the congregation and the remaining property, which he estimated at 25 acres, to whomever it sees fit. Terrence C. Donilon, a spokesman for the archdiocese, said in telephone interview Sunday that a sale to the congregation was not an option. Donilon said the archdiocese has been in regular contact with the congregation and assigned a liaison to communicate with it, but its members have refused to move on when church decisions did not go their way. The archdiocese, Donilon said, has to prioritize the greater good of parishioners at its 289 open parishes, and he would like to see the congregation of St. Frances do the same. “It’s a shame because there are many parishes across the archdiocese that could use their energy and their talent and their commitment,” he said. That commitment has kept the church doors open and its charitable work ongoing, parishioners said, including a weekly food pantry. In some cases, it has led to unconventional choices. Since no priest can celebrate Mass here, two women from the congregation take turns leading lay services. Barbara Nappa, 79, who officiated on Sunday, said she was just doing what the church needed. Rogers said he believes the archdiocese will not negotiate with parishioners because land is so valuable in this desirable area a quarter-mile from Scituate’s Egypt Beach, where undeveloped half-acre lots can sell for $500,000. “If we were looking at just the value, we would have ended on day one and sold it back when it started,” Donilon said. For some, St. Frances has been a constant through periods of change in the Catholic Church and the wider world. Lifelong parishioner Nancy Fay, 52, was baptized at the church, attended its nursery school, and in 2011 held her mother’s funeral there.